Sony WH-1000XM2 is a very stylish headband-style wireless headphone that was launched in 2017. The key feature of this headphone is excellent noise isolation, easy to use features and the perfect Hi-Res audio playback over Bluetooth. Besides, the smart listening via smart auto setting is something to look forward to. This extremely features rich device wins over other competitors due to its exceptional sound quality and positive Sony WH-1000XM2 review customers have been talking about. 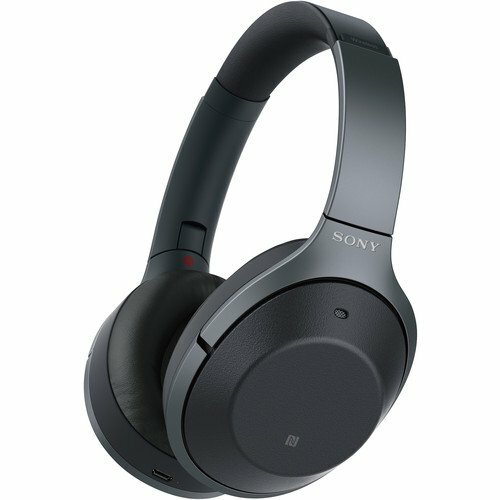 Sony WH1000XM2 noise canceling headphones not only have enhanced features and finish but a breezy accessibility greatly simplified for the end user. Simply put Sony WH1000XM2 headphones have been designed to be your everyday headphones. It is designed for people who love their space even in the din of noises. And why not, it has a crystal clear noise canceling feature that is suggested to be better than competitors mainly, Bose. The sound quality is exceptionally great, and you can customize the sound profiles according to your taste. Besides, the customization is something everyone likes and EQ settings in the app help you do that. You can increase or decrease the ambient noise that you want in. You can filter out ambient noise while allowing relevant voices to come through which are very useful when you want to hear public announcements at the airports to alert you about the schedule. Being travel grade premium headphone some believe they can’t be used as your everyday headphones but Sony WH1000XM2 has ensured to make it great for use with these characteristic tricks. And so with Quick Attention mode, you can listen to all outside noise without taking headphones off. The LDAC codec enables Hi-Res Audio playback for but your player must support that standard. Fairly well priced taking into account all the latest features this top rated headphone has to offer. It will be a buy worth its name which is reason enough to own your very own Sony WH1000XM2 wireless noise-canceling headphones. A lot of tweaks have been done in Sony WH-1000XM2. These changes aren’t very subtle in comparison to Sony MDR-1000X, its previous version. Here are other features that make this headphone a little league apart from the rest. Industry grade noise cancellation and wireless. Touch sensitive control made simpler and tighter in the right ear cup to make the input responses even more accurate. While there is defiantly battery drainage you still have a battery sustenance of 30 hours (wireless) or 40 hours (wired) in comparison to 20 hours in its predecessor. Atmospheric pressure sensor gives you best noise cancellation by measuring the surrounding air pressure and subsequently compensating for it no matter where you are. aptX HD support gives you a high-quality Bluetooth format to get the hi-res audio up to 24bit/48kHz. LDAC, on the other hand, is a proprietary Sony format and can handle 24bit/96kHz. Not just this, the NFC chip gives you a really quick Bluetooth pairing. Besides noticing the air pressure, the advance and improved Optimizer feature scan the side of your head to calculate if the seal is a good fit while rounding factors like sunglasses and big hair to enhance and adjust sound accordingly. Prioritizing connection stability over sound quality and vice versa is another handy feature. The DSEE (Digital Sound Enhancement Engine) processing enables stepping-up compressed audio giving you unmatched sound quality. You will find the Sony WH-1000XM2 to be an incredibly comfortable headphone set. The large earcups give enough space for your ears to sit unfettered. However, for people with big ears, there might be an issue of ears touching the driver. Other than that, the padding on the earpads is excellent and the headband is also well protected. Sony WH-1000XM2 fits so easily over your head and ears with perfect clamping force. The earcups are large with right padding on the ear pads, giving you enough space. However, if your ears are exceptionally large you might find the ears touching the driver. You can use the headphones for a longer time period and they won’t hurt the ears, head or create any kind of pressure around the jaw that most headphones do. You might also like to wear headphones around the neck when not in use. You will find Sony WH1000-XM2 to be least obtrusive as you can always swivel them to a flat position. But then, you might also find the headphones to be a tad overweight with low heat dispersion through angled drivers. But this might become insignificant when you see the comfort level, sound quality and of course the mighty feature list. Industry-leading noise cancellation is one of the main USPs of this dynamic headphone. The Sony WH-1000XM2 Review for sound cancellation bags a mixed opinion where one set vouchsafes it be a class apart. Sounds like loud cafe chatter, crowded subways, roaring engine blast, drills, crowded spaces, loudspeaker announcements etc were brought down to a whisper. On the other hand, some feel that the noise canceling feature is just about average with nothing special when used without ANC. Sony noise canceling headphones WH1000XM2 primarily muffles the noises over a broader range of frequencies. The optimization with personal and atmospheric pressure gets even smarter giving sound quality based on individual listening taste and user altitude. There’s an important point about noise-canceling worth mentioning which has been getting user backlash. If you are wearing the headphone just for noise canceling and not for listening anything then it might shut down after 5 minutes to save battery life. In such case, you can go wired by plugging the included cable and keep the noise canceling on. So the vote of sound isolation and noise cancellation undoubtedly bend towards the Sony WH1000XM2 because it is versatile and intuitive. In fact, the headphone app tugs along with the accelerometers in your phone to adjust the noise cancellation by determining your body’s motion, as in – at rest, in motion or in transit. That’s the level of precision the headphones are offering. Sony has made every effort to make Sony WH1000XM2 look and feel vibrant with a very posh finish. The earcups design to the headband to earpads everything has been designed to give perfection. Sony WH-1000XM2 comes with a 3.5mm cable, a micro USB cable and a compact hard-shell case. The swivel points are quite robust with a headband that has great stretchability without giving any hint of cracks. They still look as stylish and sleek as without a stretch. The only issue the design may pose is the fact that Sony WH-1000XM2 looks less fashionable because of its bulkiness with extended earcups off the head. But overall the uniformly minimalistic design of the headphone wins with a two decent color offering – an all-black and all-white. Another problem area would be the Sony 1000XM2 being exclusively driven by touch controls. A seasoned user won’t find it difficult to operate but an uninitiated user might get thoroughly confused with functionality and the touch inputs. Sony WH-1000XM2 isn’t going to simply impress you for it noise canceling but also for the smart intuitive feature it has. Like the ‘Staying’ mode which lets some voices in while the ‘Walking’ mode helps you listen to more ambient noise so that approaching traffic isn’t a cause of worry. The ‘Transport mode’ triggers maximum noise cancellation. All this takes the performance of Sony WH-1000XM2 to a level higher than its competitors in the wireless headphone market. But a headphone can’t stand by its feature alone. And so when you look at the audio performance of Sony WH1000XM2 you still stay amazed. You have a delightful entertaining listening that is a blend of hard-hitting dynamic delivery, energetic response and impressive rhythmic precision. The credit for this can be given to robust articulation and neutral tonal balance which in no way feels artificial or tutored. Battery life of Sony WH-1000XM2 is awesome! As mentioned before the battery life has been infused to last longer than its previous version – up to 30 hours (unwired) and 40 hours (wired). And in case your headphone runs out of the battery, the quick charge function is there to help you. The quick charging is so efficient that a mere 10-minute plug to the charger can give you a surprising 70 minutes playback time. There has been a negative review for Sony WH-1000XM2 using the time-tested Micro-USB standard as charging port and not the USB-C port. However, this issue seems very insignificant and might see a revision in the future versions with Sony moving to a C variant port in future models. Intuitive features with easy customization. Touch controls might confuse first time user. A tad bulky which might slightly affect the aesthetics of headphones. Micro-USB instead of USB-C port. If you are searching for an unbeatable headphone with all-round delivery – your answer is Sony WH1000XM2. The minimalistic design, the exception audio quality and the precision-oriented noise cancellation isn’t just a gimmick, it is a reality. Yes, you might find a few glitches so to say but they seem trivial when the overall package of Sony WH1000XM2 wireless noise-canceling headphones is seen. Hope you enjoyed reading this review as much as I enjoyed writing it. If you have any questions then please do feel to comment below.